1In 1648 the Amsterdam architect Philips Vingboons (1607–1678) published his first book with engravings of his own designs from the past decade1. In the introduction he wrote a brief history of architecture, from its biblical and antique origins up to his own time, including finally his own work. He informs us that in Holland “only recently had the love for true architecture according to the principles and rules of the Antique revived” (naest weynige jaren herwaerts [heeft] de liefde tot de Bouwkonst, op maet en regelen der Ouden, alhier soo toegenomen). 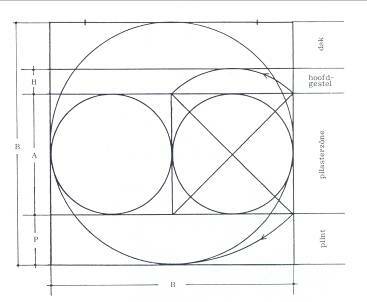 “The rules of the Antique” of course refers to Vitruvian principles and their contemporary interpretation. And indeed, in Holland this kind of architecture had gained general favour only in the last 15 years. From the mid 1630s onwards classicist architecture inspired by the publications of Andrea Palladio and Vincenzo Scamozzi had gradually become the main standard for architecture in the Dutch Republic. Inspiration from Palladio and Scamozzi can be found in Dutch seventeenth-century front façades and ground plans, as well as in the details and proportions of the classical orders and their ornaments2. On a more scholarly level especially Scamozzi’s L’Idea della architectura universale (1615) may be regarded as the principal source for understanding the classic principles as well as the possibilities for their contemporary use3. In 1658 Scamozzi’s book III was translated into Dutch, his book VI having already been translated in 1640, with more than 27 new editions up to the mid nineteenth century4. The most important protagonists in this development had been the architects Salomon de Bray and Jacob van Campen, followed by their younger colleagues Pieter Post, Arent van ‘s-Gravesande, and Philips Vingboons5. 2This paper concentrates on the design systems of this small group of seventeenth-century Dutch architects in order to explore to what extent theoretical notions of architectural design according to the principles of proportion and harmony as expressed by Scamozzi (following in the footsteps of Alberti and Palladio) had been practiced in Holland as well. Was the use of classical architecture limited to a kind of fancy dressing up of façades, nothing more than another kind of ornament? Or were at least some architects seriously trying to emulate humanist principles in which the mathematical system of Euclid and Pythagoras was regarded as the key to understand divine and universal order and thus as the first principle of architectural beauty? 3To answer this question we limit our focus to projects for new and freestanding buildings where no old structures dictated any architectural solution. Within this group we can only use projects that are well documented by original drawings or contemporary prints of the design, since what interests us now are the design principles as practised on the architect’s desk, not the measurements of the final constructions that are always less perfect than what was envisioned on the drawing table. 4Mathematical principles always were dominant in Dutch seventeenth-century architectural handbooks. Even before the rise of the classical ideal in Holland, architectural design had been regarded as a kind of applied mathematics. Posthumous editions of Hans Vredeman de Vries’s Architectura of 1606 were incorporated in books on geometry, land surveying and fortification. 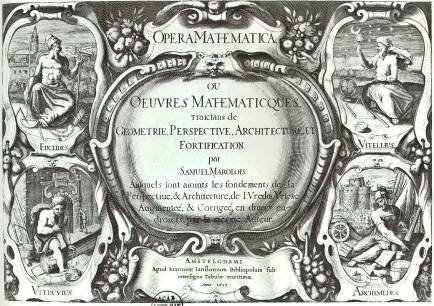 On the frontispiece of the 1617 Amsterdam edition of Marolois’ Opera mathematica we find Vitruvius together with his antique colleagues Euclides (geometry), Vitellius (surveying) and Archimedes (fortification) (fig. 1). In the introduction to the Architectura moderna of 1631, the posthumous publication of the works of Hendrick de Keyser (1565–1621), Salomon de Bray explains that only by the use of mathematical principles can the craft of building be elevated to the art of architecture. 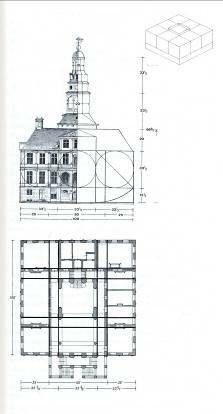 Therefore the reader was encouraged to check the true principles of De Keyser’s designs by checking the proportions of his buildings as shown in the engravings: “(…) de selve met de ware redenen der wiskonstighe Bouwinge [te] proeven ende near [te] meten”. 5Such a focus on mathematics is not surprising since all Dutch society was permeated with mathematics. Mathematics was essential to the Dutch mercantile and maritime society as such, necessary for everybody educated to pursue trade and navigation as well as building and fortification, even before the rise of the classical architecture. The first six books of Euclid may be regarded as a starting point for any applied science in this period, architecture included. All mathematical principles, as explained for example in Serlio’s Book I or Scamozzi’s Book I, are based on these same first six chapters of Euclid, including geometry and proportions as well as square root-proportions and quadratura principles with squares and circles (Euclid Book 4; 6-9). In Holland these basics from Euclid were taught in school everywhere, generally using the Dutch edition by Jan Pietersz. Dou from Leiden, published for the first time in 1606 and reprinted many times. 6The focus on proportions in the works of Palladio and Scamozzi fitted easily into Dutch society, not only among the scholarly elite but also among the intellectual middle class. 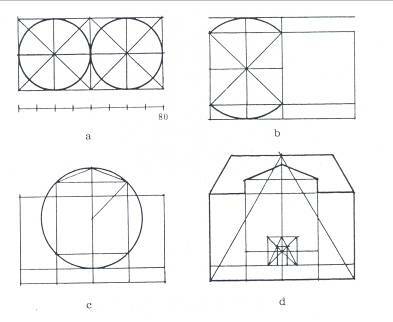 As elsewhere, mathematical principles were used in architectural design at all times but, with the introduction of the Vitruvian theory in its contemporary transformation by Palladio and Scamozzi, proportions became an essential for architectural beauty and thus a major issue in architectural theory. This is reflected in contemporary architectural drawings and designs. 7We have a few authentic witnesses for the use of mathematical systems in architectural design practice. The first is a whole series of hundreds of drawings made by Nicolaus Goldmann, a teacher in architecture in Leiden from 1640 until his death in 16656. His course may be regarded as a private enterprise next to the official school for surveyors and military engineers, the so-called Duytsche Mathematique, founded by Prince Maurits according to a teaching programme by Simon Stevin7. Goldmann’s drawings were made in the mid seventeenth century while teaching his pupils, like sketches on a blackboard. They show how to design all kinds of building types according to fixed mathematical principles. Goldmann followed the classical ideal of a mathematically perfect universe created by divine will and order. Mankind could only produce something of any value by following these eternal and universal principles. Goldmann’s architectural designs are not created for real execution but as a teaching model to explain his principles. 8 First published in Terwen & Ottenheym, Pieter Post, op. cit. n. 6, p. 219. He works with very simple rational numbers, in principle arithmetical proportions. Root proportions are used as well, but not often. One of his most basic instruction examples shows a villa on a square ground plan of 30 x 30 moduli (Goldmann always uses an abstract measure, never real feet)8. The walls of this villa are also 30 moduli high, the height of the roof excluded (figs. 2, 3). The groundplan is divided into nine squares of 10 x 10 moduli, with outer walls of 2 moduli and inner walls of 1 modulus wide, thus creating nine inner spaces of 8 x 8 moduli (as said before, this is not meant to be a functional building but merely a first step in the art of mathematical design). The exterior height is divided into 5 moduli for the cellars and 25 for the main and upper floor together. Pilasters are 2 moduli wide and 20 high (1: 10), with a sousbasement profile of 1 modulus below and crowned by an entablature 4 moduli in height, in a proportion of 1: 5 with the pilasters below. The central bay is 10 moduli wide (with an intercolumnium of 8), the two outer bays 8 each (with an intercolumnium of 6 moduli), and 1 modulus at each end in order to support the projecting parts of the outer pilasters’ bases and capitals. In his manuscript: Oude en ware beschrijving van Schieland, 1672, coll. Gemeentearchief Roterdam. Drawing by the author (after Terwen 1983). 9 A.M. Meyerman, Schielandshuis, Zwolle, Waanders, 1987. 8A second important contemporary source is a drawing made by Jacob Lois of his design of the Schielandshuis in Rotterdam, built in 1662 (fig. 4)9. 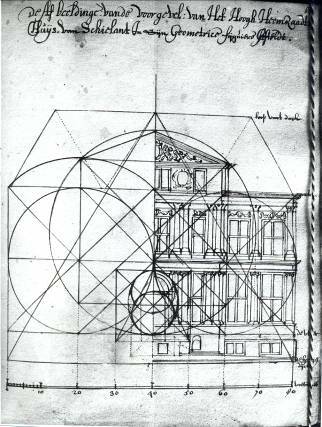 Ten years later, in 1672, the architect wrote a manuscript book on the history of this institution, which controlled the dikes and polders in the area, and in this book he made this drawing of the geometrical system of his façade design (fig. 5)10. At first glance this seems to be utter abracadabra, but in fact he is just showing various steps of his very lucid design system in one drawing (fig. 6 A- F). The starting point is two squares, creating a regular rectangle of 80 x 40 feet (A). The central projection has a width of 40 feet thus creating a façade rhythm of 20 : 40 : 20 feet (C). Square root proportions are used to find the height of the basement (B) as well as for the height of the central projection (D) and its pediment (E). The height of the roof is determined by a equilateral triangle (F). 9These contemporary examples show us some general principles. 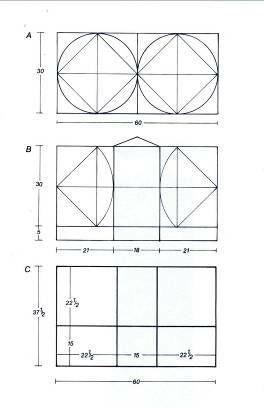 First the general outline of the volume or façade has to be found, based on a regular rectangle, preferably based on squares, that may be enlarged by volumes based on easy rational proportions or square root proportions. After the principal measures are defined, the classical orders are added as details of the second rank, and after these the other ornaments, if any. These principles may be used as a starting point to investigate other design projects of the same period. Apparently here we have a set of design tools that we may use to investigate seventeenth-century Dutch architecture without the risk of anachronistic over-interpretation, a serious danger as the historiography of the research on architectural proportions evidently shows. 10Philips Vingboons concludes his 1648 publication with some unrealised and even unrealistic villa projects (fig. 7). Published in his Afbeelsels of 1648. He is completely aware this is beyond the Dutch scale and the demands of his mercantile patrons. Apparently this is a true “capriccio” merely to show his capacity to master the ideal of perfect proportions. In one of these he indeed explains: “perhaps this design is too grand and expensive but we may build it in the same system on a lesser scale” (al is het begryp en de huijsingh kostelijck toegestelt, kan echter wel op een geringere en kleynder manier herstelt worden en evenwel dese verdeelingen houden). The villa on fols. 53-55 is based on a square of 96 x 96 feet, enlarged with central projections at all four sides, 48 feet wide and 12 feet deep, creating façades with a length of 120 feet on all sides, divided into 12 - 24 - 48 - 24 - 12 feet, thus in a proportion of 1 : 2 : 4 : 2 : 1 (fig. 8). The height of the façades, from the pavement of the ground floor up to the cornice, is 48 feet as well, placed on a basement table 5 feet in height (with the upper part of the basement floor). The result is that the front of the central projection is a square of 48 x 48 feet, flanked by walls each of 24 x 48 feet and of 12 x 48 feet at both ends. 11In the ground plan of 120 x 120 feet we find in fact two interwoven ratios: a system in which these 120 feet have been divided into 10 units of 12 feet (like the exterior) as well as a second system that divides it into 8 units of 15 feet. This creates the possibility for manifold proportions of the internal spaces, like 12 x 12, 15 x 15, 15 x 30, but also combinations of both systems, like 12 x 15 (4:5), 15 x 24 (5:8) and 24 x 30 (4:5). The entrance hall measures 48 x 30 (8:5), both grand side rooms are 30 x 50 (3:5), and the main saloon at the rear 48 x 45 feet (16:15). These interior measurements are all theoretical proportions, created by lines not by actual walls. In reality these proportions are far less ‘mathematically perfect’ because of the thickness of the walls that are always constructed alongside the theoretical lines. Drawing by the author based on Post’s publication of his town hall design of 1664. 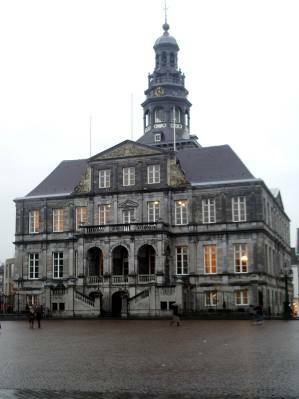 12This system, as shown in this theoretical design of Vingboons, may well be compared with the design of a real building, the Town Hall of Maastricht, designed in 1656 by Pieter Post and built in 1659–1664 (fig. 9)11. This investigation is based on the original design as published by Post himself in 166612. It is a freestanding square building, centrally located on a market square. Its ground plan measures 100 x 100 feet, divided into a ratio of 25 - 50 - 25 feet as well as into 33 ⅓ - 33 ⅓ - 33 ⅓ feet (fig. 10). The first and second storeys together are also 33 ⅓ feet high, situated on a ground floor of 13 ⅓ feet, the root square proportion of 33 ⅓. In the interior plan, the central hall is 50 feet wide and 75 feet long, surrounded by various rooms, all with a width of 25 feet. This main space includes the upper floor and is surrounded by a gallery that connects the rooms of the upper floor. Within the main hall the substructure of the central tower is situated, measuring 33 ⅓ x 33 ⅓ feet (this central space, with a dome on top – with an open oculus – also served as the high court of justice). Again, the real measurements of the internal spaces are less perfect due to the thickness of the walls that are situated alongside the mathematical system’s lines. The proportional system has been used to facilitate the division of the ground plan in a logical and mathematically correct way, not for creating mathematically ideal rooms. 13In private buildings of a somewhat more modest scale, like the country houses of the Amsterdam mercantile elite, we still find these rational principles based on squares in the façade designs, but in the lay-out of the plan the square is replaced by rectangles that create a less theoretical but more practical ground plan, as two examples from Philips Vingboons will show, both situated on the banks of the river Vecht, the famous place of retreat among the Amsterdam elite. Drawing by the author, based on engravings in Vingboons’ publication of 1674. 14In 1655 Vingboons designed a country house called Gansenhoef, published in 1674 his second book13. In fact this is the most basic design of all his country houses. It has an astylar brick façade with the proportion of a double square, 26 x 52 feet, on a basement 4 feet in height (fig. 11). The side walls are 46 feet long, in a proportion of 7 : 8 to the length of the front at 52 feet. The ground plan of 52 x 46 feet is divided into a grid with units of various sizes: the length of 52 is divided into 20 - 12 - 20 feet and the width of 46 into 18 - 10 - 18 feet, creating a very flexible system in order to have a great variety of dimensions for all kinds of rooms. As in all the other examples shown above, the walls are positioned against these lines and as a result the rooms themselves only refer vaguely to the proportions of the grid system. Drawing by the author based on engravings in Vingboons’ publication of 1674. 15The same system, but now with some additional geometry, can be found in Vechtvliet, designed in 1665 in fact not far from Gansenhoef (fig. 12)14. The design of the façade started once more with a double square, in this case of 60 x 30 feet, located on a basement of 5 feet. This is an astylar façade as well but it has a central projection with a width of 18 feet, constructed geometrically by the square root proportion of 15 feet (i.e., half of the diagonal of the basic square of 30 x 30). As a result the rhythm of the façade became 21 - 18 - 21 feet. In the interior this geometrical division is not used. Instead, there the length of 60 feet is divided arithmetically as 22 ½ - 15 - 22 ½, i.e., in a proportion of 3 : 2 : 3. The width of the house is divided into 15 and 22 ½ feet, again creating a flexible grid with various possibilities15. 16 Meischke & Reeser, Het Trippenhuis te Amsterdam, op. cit. n. 11. 17 Terwen, Het Trippenhuis te Amsterdam, op. cit. n. 11, p. 171-181. 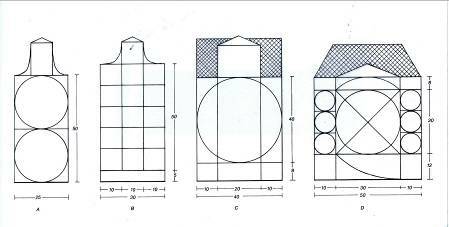 16Within the city walls the use of this kind of mathematical framework was restricted to the front façades. The existing building plots dictated more practical solutions for the size and division of the ground plans. Nevertheless in these façade designs we recognise the same principles. 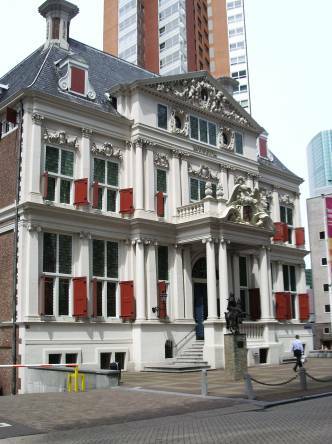 The utmost example of civic luxury is the Trippenhuis in Amsterdam, built in 1660–1662 by Justus Vingboons (Philips’s younger brother) for two industrial magnates, the brothers Louis and Hendrick Trip (fig. 13)16. The grand facade, executed in stone, with Corinthian pilasters over seven bays, in fact hides two independent houses. Behind the windows on the central axis a wall divides the two houses. The only internal connection is on the ground floor where a door connects the offices of the two brothers. 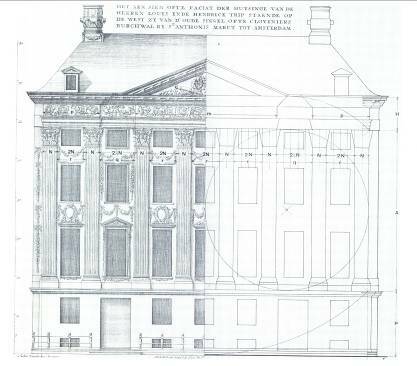 In reality the façade is 83 feet wide but in his architectural design Justus Vingboons used only 80 feet, leaving two ‘blank’ wall strips of 1 ½ foot at each end. 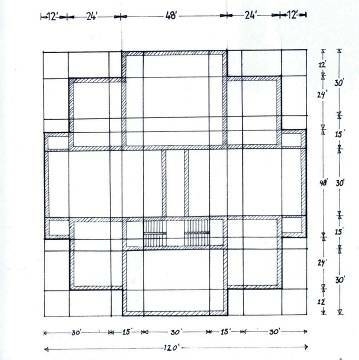 The scheme is based on a double square of 40 x 80 feet, placed on a basement of 16 feet, which is the square root of 40, as demonstrated by Jan Terwen in 1983 (fig. 14)17. The same square root is used to determine the total height of the building, including the roof, while the height of the entablature is taken from the half-size diagonal (the root square of 20). The pilasters have a width of 3 ½ feet each and this was taken as the modulus of the façade, with a general intercolumnium of 2 moduli (7 feet), and two broader intercolumnia for both entrance bays, each 8 ½ feet wide (2 3/7 moduli – i.e., almost 2 ½). As a result the two outer projections are 4 moduli wide while the central projection measures 10 moduli. The pilasters are exactly 40 feet high, which, according to Scamozzi, should be ten times the modulus of the Corinthian column from which the pilaster originated18. 17In Philips Vingboons’ own designs for houses of all kinds – from a regular building plot with a width of 26 feet, up to a double plot of 50 feet – he invented a kind of standard proportion according to the classical ideals, which he used in many variations. Again this above all is based on the designs as published by Vingboons himself in 1648 and his second book from 1674 (fig. 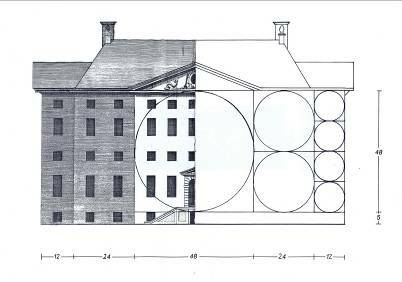 15) Houses on building plots of 26 feet, the standard along the new canals of Amsterdam after 1660, were based on a system of 25 feet wide and 50 feet high (with two blank wall zones of half a foot on both sides). On the standard plots of 30 feet, in the first part of the canal system of the first half of the seventeenth century, he generally designed a façade of 50 feet high on a substructure of 5 feet (with the downstairs entrance and windows). On building plots of double size, 52 feet wide, he worked with a system of 50 feet wide, with two blank zones of 1 foot on each side. In general these broad houses have a central projection of 30 feet, creating a rhythm of 10 – 30 – 10 feet. The height of the basement is more than once determined by the square root proportion of 30, i.e., 12 feet. In this system the pilasters used on the central projection are 30 feet high, crowned by an entablature of 6 feet, which is one-fifth of the pilaster height, as it should be, according to Scamozzi, in the Ionic, Roman and Corinthian orders. 18To most builders and contractors in Holland the introduction of the classical architecture according to Palladio and Scamozzi was nothing more than a change of ornament. Only among a small group of architects, like Jacob van Campen, Pieter Post and Philips Vingboons, and some of their patrons, were the theoretical principles of this kind of architecture seriously studied and fully understood19. The examples discussed here were selected from this limited group. To them, the ‘true principles according to the proportions and rules of the Antique’ was not just a hollow phrase, but the clue to a rather strict and clear design system for all kinds of buildings. Notwithstanding its mathematical principles, their system, as far as we may reconstruct it today, was neither stiff nor inflexible. It contained the possibility for variations without end and individual solutions fit for any specific occasion or building. Moreover, the system became the core of their architectural aesthetics, following the tradition started by Alberti two centuries before, where the essentials of classical architecture are not the five orders or other ornament, but the harmony of proportion of the design. * This article is based on two existing studies published by the author on the same subject, both only available in Dutch: Konrad A. Ottenheym, ‘Mathematische uitgangspunten van de Hollandse bouwkunst in de 17de eeuw’, De zeventiende eeuw 7 (1991), p. 17-35; Idem, ‘Harmonische proportie in de Hollandse bouwkunst van de zeventiende eeuw’, in: Jacomien Prins and Mariken Teeuwen (eds. ), Harmonisch labyrint. De muziek van de kosmos in de westerse wereld, Hilversum (Verloren), 2007, p. 95-110. 1 Philips Vingboons, Afbeelsels der voornaemste gebouwen uyt alle die Philips Vingboons geordineert heeft, Amsterdam, 1648. 2 Konrad A. Ottenheym, “Classicism in the Northern Netherlands in the Seventeenth Century”, in: Guido Beltramini and Howard Burns (eds. 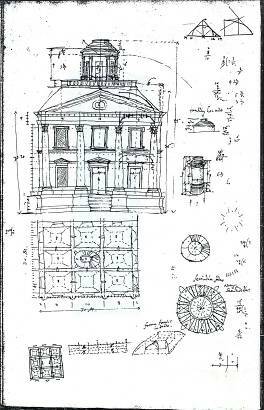 ), Palladio and Northern Europe. Books, Travellers, Architects, Milan (Skira) 1999, p. 150-167; Krista De Jonge and Konrad A. Ottenheym, Unity and Discontinuity. Architectural Relationships between the Southern and Northern Low Countries 1530–1700, Turnhout (Brepols Publishers), 2007. 3 J.J. Terwen, ‘Mag de bouwkunst van het Hollands classicisme “palladiaans” genoemd worden?’, Nederlands Kumnsthistorisch Jaarboek, 33, 1983, p. 169-189; Konrad A. Ottenheym, « L’Idea della architettura universale de Vincenzo Scamozzi et l’architecture du xviie siècle aux Pays-Bas », in: Michèle-Caroline Heck, Frédérique Lemerle and Yves Pauwels (eds. ), Théorie des arts et création artistique dans l’Europe du Nord du xvie au début du xviiie siècle, Lille (UL3) 2002, p. 121-139. 4 J.J. Terwen, Nederlands…, op. cit. n. 4; Arnold Witte and Andrew Hopkins, “From de luxe architectural book to builder’s manual: the Dutch editions of Scamozzi’s L’Idea della architectura universale”, Quaerendo, 26, 1996, p. 274-302. See also the recent English translations of Scamozzi’s Books III and VI: Vincenzo Scamozzi, Venetian Architect, The Idea of a Universal Architecture, Villas and Country Estates, Amsterdam, Architectura et Natura Press, 2003; Vincenzo Scamozzi, Venetian Architect, The Idea of a Universal Architecture, The Architectural Orders and their Application, Amsterdam, Architectura et Natura Press, 2007. 5 Friso Lammertse, ‘Salomon de Bray, schilder, bouwmeester en theoreticus’, in: Pieter Biesboer (ed. ), Salomon, Jan, Joseph en Dirck de Bray. Vier schilders in één gezin, (Exh. Cat. Frans Halsmuseum Haarlem), Zwolle, Waanders, 2008, p. 10-16; Jacobine Huisken et alii. (eds. ), Jacob van Campen en het klassieke ideaal van de Gouden Eeuw, Amsterdam, Architectura et Natura Press, 1995; Konrad A. Ottenheym, Philips Vingboons (1607–1678), architect, Zutphen, Walburg Pers, 1989; Jan J. Terwen and Konrad A. Ottenheym, Pieter Post (1608–1669), architect, Zutphen, Walburg Pers, 1993; Guido Steenmeijer, ‘Tot cieraet ende aensien deser stede’. Arent van ‘s- Gravesande, architect en ingenieur, ca. 1610-1662, Leiden, Primavera Pers, 2005. 6 Jeroen Goudeau, Nicolaus Goldmann (1611-1665) en de wiskundige architectuurwetenschap, Groningen, Philip Elgers, 2005; Idem, “A Northern Scamozzi: Nicolaus Goldmann and the Universal Theory of Architecture”, Annali di architettura 18-19, 2006-2007, p. 235-248. 7 E. Muller and Kees Zandvliet, Admissies als landmeter in Nederland voor 1811, Alphen aan den Rijn, Canaletto, 1987, p. 23-27; Charles Van den Heuvel, ‘Simon Stevin, De Crychconst en de Duytsche Mathematique’, in: Guido Vanden Bergheet alii., Simon Stevin (1548-1620). De geboorte van de nieuwe wetenschap, Brussels/Turnhout, Brepols Publishers, 2004, p. 103-113. 10 Jan J. Terwen, ‘Het mathematisch system van de gevel’, in: R. Meischke and H.E. Reeser (eds. 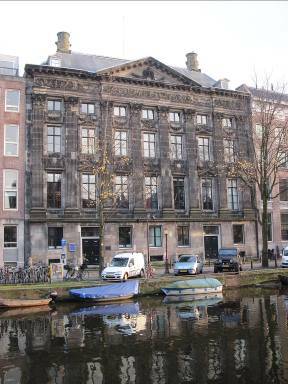 ), Het Trippenhuis te Amsterdam, Amsterdam, Oxford/New York, Noord-Hollandse Uitgevers Maatschappij, 1983, p. 171-181 (Schielandshuis on p. 172-173); Terwen & Ottenheym, Pieter Post, op. cit. n. 6, p. 218. 11 A.R. Ed de Heer and Servé Minis (eds. ), “Een seer magnifick Stadthuy”. Tien studies over de bouw en de inrichting van het stadhuis van Maastricht, Leiden and Delft, Delftse Uitgevers Maatschappij, 1985; Terwen & Ottenheym, Pieter Post, op. cit. n. 6, p. 176-182, 226-227. 12 Ibid. The architect did not supervise the building site (since the city of Maastricht was 200 km away from his home town of The Hague,) and the final result differs in many details and in essential proportions from the design. 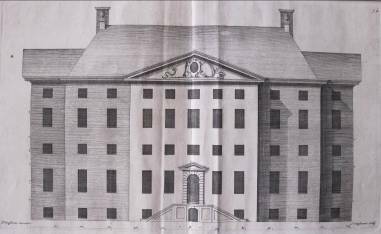 In 1664, when the building was finished, Post published his own original designs in a series of engravings. 13 Philips Vingboons, Tweede deel van de Afbeeldsels der voornaemste gebouwen uyt alle die Philips Vingboons geordineert heeft, Amsterdam, 1674, fols. 27-30. Ottenheym, Philips Vingboons,op. cit. n. 6, p. 47-50, 164-165. 14 Vingboons, Tweede deel van de Afbeeldsels…, op. cit. n. 14, fols. 64-65. Ottenheym, Philips Vingboons,op. cit. n. 6, pp. 47-50, 165-166. 15 Apparently Vingboons added here half a foot in order to create better interior measures. As a result the width of the house is 38 feet, which is 6 inch too much for a mathematically perfect size of 37 ½, that is, five-eighths of the length of 60 feet. 18 The width of a pilaster is not equal to that of the column. Instead the width of a pilaster is taken from the upper size of the column, just below the capital, where, according to Scamozzi, a column has only seven-eighths of its size below. The height of a pilaster, on the other hand, must be determined by the modulus of the column, that is, eight-sevenths of the width of the pilaster, in this case 8/7 x 3 ½ = 4 feet. 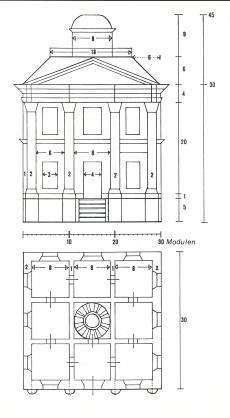 With a height of 40 feet (10 moduli), the Trippenhuis pilasters have the correct proportions according to Scamozzi’s rule for the Corinthian order. Terwen 1983, op. cit. n. 11, p. 177. 19 For other detailed examples of the use of design systems by Post and Vingboons, see Ottenheym, Philips Vingboons, op. cit. n. 6, p. 162-172, and Terwen & Ottenheym, Pieter Post, op. cit. n. 6, p. 220-237. For an analysis of van Campen’s town hall design, based on a regular grid pattern of 10 x 10 feet, see Cornelis Wegener Sleewijk, ‘De maten van het paleis op den Dam te Amsterdam’, Bouwkundig Weekblad Architectura, 1940, p. 338-341. 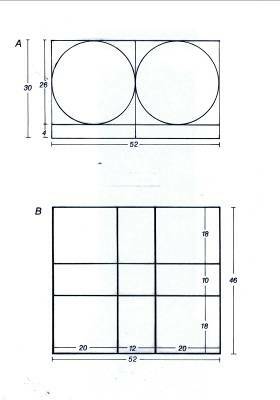 Konrad Ottenheym, « “Architecture according to proportions and rules of the Antique.” », in Jean-Philippe Garric, Frédérique Lemerle et Yves Pauwels (dir. ), Architecture et théorie. L’héritage de la Renaissance (« Actes de colloques »). Professor for architectural history at Utrecht University (The Netherlands).He teaches architectural history of Europe ca. 1400-1800. His research topics are focussed on the classical tradition in the architecture of the early modern period in the Low Countries (16th-17th centuries); the reception of Italian (and French) sources in the Low Countries and the architectural exchanges between the Low Countries and the other countries in Northern Europe, Britain, Scandinavia, Northern Germany, Poland and the Baltic region.